Distinguishing Characteristics Caucasian male. Brown hair. Glen was raised in Hansen, Idaho and attended the University Of Idaho. He was employed as a farmer in the area and was also an avid outdoorsman. Glen traveled to California in February 1927 and met Bessie Haley aboard a passenger ship from San Francisco to Los Angeles. Bessie and Glen began a romantic relationship afterwards and wanted to marry, but Bessie was still legally wed to her first husband, Earl Helmick. He refused to agree to a divorce, so Bessie moved to Elko, Nevada to meet residency requirements for a decree in that state. Their divorce was finalized on April 11, 1928; Bessie and Glen married in Twin Falls, Idaho on April 12. Glen and Bessie took a honeymoon rafting trip down the Green River and Colorado River during the fall of 1928. Glen was an experienced rafter, while Bessie was a novice. They boarded a handmade flat-bottomed wooden sweep scow, a craft commonly used for Idaho river rafting at the time. The scow weighed two tons. Glen refused to carry life preservers or jackets on board, also keeping with the general rafting customs of the day. The couple arrived at the home of Emery Kolb, a photographer who maintained a small riding business on the rim of the Grand Canyon in northern Arizona, on November 15. The Hydes said that they were stopping to restock their supplies. They asked Kolb to take a photo of them posing by the canyon's rim; they planned to retrieve the picture on their return trip. Kolb thought Bessie appeared apprehensive about the remainder of the journey. He told Glen that he needed some form of life-saving equipment on board, but Glen disregarded the warning. Glen and Bessie departed Kolb's property after restocking their scow near Bright Angel Trail. The couple has never been heard from again. 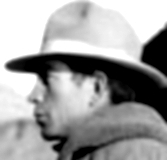 Glen's father assisted with the search effort when the Hydes failed to return to Idaho by early December 1928. A small plane located their abandoned scow in the river in mid-December, and some searchers in a boat went to examine it on December 25. The craft was upright and fully stocked with supplies, including the couple's coats and hiking boots, Bessie's diary, and Glen's gun, but there was no sign of the pair. About one foot of water was also discovered on board the boat, but authorities were not certain if it was part of the Hydes' supply or simply overflow from the rapids. The boat's tow line was underwater and was caught on something; the searchers had to cut it. Forty-two notches were carved in the gunwale of the scow, one for each day of the trip. An extensive search of the area produced no clues as to Glen and Bessie's whereabouts. Investigators presumed the couple died in some type of accident in the river. Glen's father believed that they had difficulties with their craft and attempted to hike out of the Grand Canyon, but became lost and died in the woods. No evidence has been located to support that theory. Elizabeth Arnold Cutler, a woman who traveled down the Grand Canyon on a rafting excursion in 1971, claimed she was actually Bessie. She claimed that she stabbed Glen after a disagreement in 1928, then walked out of the woods and began a new life for herself. Cutler recanted her story immediately afterwards. She was four inches taller than Bessie, and birth records proved she was indeed Elizabeth Cutler and had been born in Pomeroy, Ohio on December 2, 1908. Cutler died in 1998. The unidentified skeleton of a man was discovered in the area in 1976 and rumors abounded that Glen's body had been recovered. The victim apparently died as the result of a bullet wound to the head. Laboratory tests conducted in 1985 concluded that the remains were not Glen's. Another woman and man were identified as Bessie and Glen in the years following the skeleton's discovery, but all of the stories turned out to be false. Bessie's brother said that Helmick had a violent temper and mentioned that some people believed he was involved in Bessie and Glen's disappearances. No evidence has been located to support the theory. Helmick remarried in 1930 and to the end of his life he refused to discuss Bessie. A witness on the river at the time the Hydes vanished said that he saw a brown leather jacket floating in the water. It is not known if the garment was connected to the Hydes' cases or if the claim is even true, but Bessie is known to have worn a leather jacket. Bessie and Glen's disappearances are no longer being investigated by law enforcement, but fascination with their cases continues. Updated 3 times since October 12, 2004. Last updated March 13, 2014; picture added.